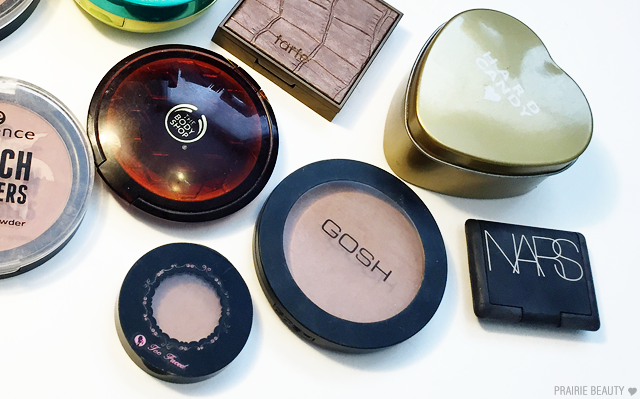 So, as I was looking at some of my makeup drawers, I was really feeling like it was time to do a bit of a cleanout. I have a couple of friends who'd been giving me winks and nudges that if I ever wanted to get rid of anything, they would have open arms, and a few of them were coming over for a party so it seemed like a good time. It also seemed like a good time to go through my collection for the blog. The biggest declutter this go around was of my cheek products, since the drawer was getting overly full and I always want to pick up more. So if you're interested in seeing what I've got in my collection - keep reading! I managed to get my hands on this right before Target left Canada after getting all grabbyhands about it for a while. Turns out I don't love it as much as I thought I would, but I do reach for it from time to time when I really want to carve out my cheekbones and am willing to put into the work to make it look good. I lovelovelove this. I'm pretty sure it was limited edition either last summer or the summer before, but I absolutely love the shade and I think it works really well once I have a little bit of tan on my skin. OBSESSED. I think this might be my favorite bronzer of life and it has definitely been the one that I've been reaching for almost every single day since I picked it up. I have a feeling this will be the first bronzer I ever hit pan on. The limited edition collection that this bronzer was released with was just ridiculously good and I still do reach for this bronzer. It has a little bit of glow, but it's quite subtle and I think this just gives you a hint of warmth and colour. This came in a subscription, I think Ipsy, and I was really impressed with it. This is the bronzer I reach for when I want more a glow to my skin, because it does have a sheen to it. The tone is great for my fair skin though. This is literally the only bronzer I can use in the winter months because it's the only one that doesn't make me look orange and weird. There was no way this one was going anywhere. This is another glowy bronzer, though I feel like this one can be a lot more subtle as far as pigmentation goes. I was reaching for this pretty consistently last summer when it came out and I will probably start reaching for it again this summer soon. I went back and forth on this because, honestly, this is a little too dark for me and I almost never reach for it. Still, I couldn't bring myself to part with it because it's such a classic and I feel like maybe at some point I'll be able to make it work. This is one of the first bronzers that I found that I really loved on my skin tone and it's one of the few that I feel like I can get some use out of all year. I don't reach for it that much anymore, but it's a good one for me and I didn't want to get rid of it. This is another one that's a hint too dark for me, but I can't bring myself to part with. I can definitely make this one work a little more easily than Laguna, but it's still a bit of a pain. Still, can't let go. 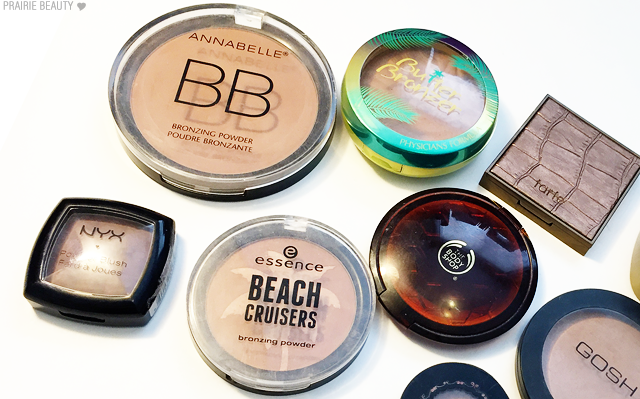 I feel good about the choices of bronzers that I decided to keep. 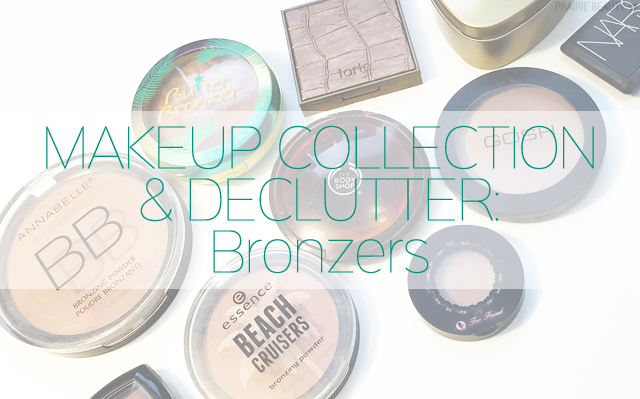 Obviously, bronzers aren't something I get particularly excited about generally, but I still have 10 in my collection. Makeup junkie, I swear. I'm getting rid of this because it's WAY too shimmery for me. I think this would look beautiful on someone with a much deeper skintone because it would just give a warm glow to the skin, but there is really no way I can make this work on me. So technically this is a blush, but whether it's a blush or a bronzer it doesn't work at all on me. 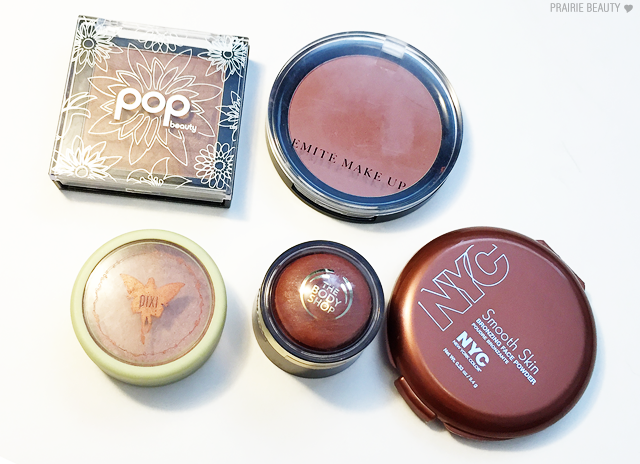 It's too deep and brown to be a blush, and too deep and red to be a bronzer on pale skin. Again, for deeper skin tones this could be a winner. SCANDAL. I know this is a cult favorite but I honestly just don't like it on me. It pulls too orange and unnatural on my skin and just doesn't look the way I want it to. This will hopefully get a good home with someone a little less fair than me. I picked this up in a swap with some other Canadian Beauty Bloggers in Toronto last summer in hopes that I could make it work, but it suffers from the same issue as most of these - doesn't work for my skintone. Also, it's got a little more glow to it than I like. One of these things is not like the others... This bronzer is just TOO LIGHT. When I have the patience to work with it and build it up, I feel like I can get a decent look, but it's just a lot of work with not enough pay off for me to keep this in my collection when I have other bronzers that get the job done more easily. So there you have it! My entire bronzer collection pared down to 10 - so clearly there's some extra space in the bronzer section of my drawer. If you have any recommendations for bronzers that look good on fair skin, I'd love to hear about them in the comments!